2020 is going to be a big year for Carnival Cruise Line. 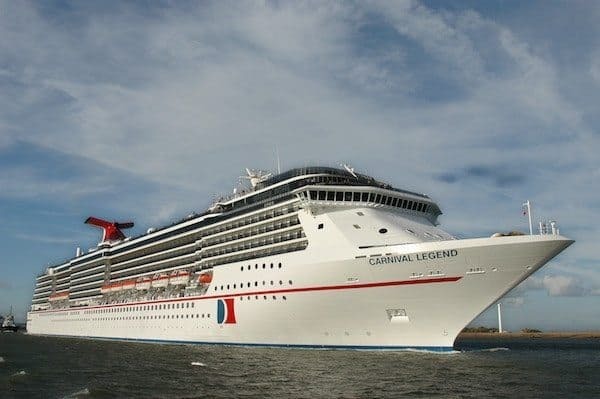 The Carnival Legend sails out of both Tampa and New York before beginning, what the cruise line is describing as, their most diverse European cruises ever. What Cruises Will We See? Before beginning her incredible slate of European cruises, Carnival Legend will sail a 13-day Carnival Journeys Panama Canal itinerary from Tampa to New York City. The trip, departing Tampa on March 3, 2020, will make stops in Cozumel, Mexico and Limon, Costa Rica before doing a partial Panama Canal transit – which will then see her hitting Cartagena, Columbia, Aruba, and Grand Turk. During her brief visit to the Big Apple, the ship will operate two nine-day Caribbean voyages (on May 16 and 25, 2020), both of which are scheduled to visit San Juan, St. Maarten, St. Thomas, and Grand Turk. On June 3, 2020, Carnival Legend will leave for the summer to set off on a 16-day trip to London. This unique trip will include day-long visits to ports in Greenland, Iceland, the Shetland Islands, and Ireland. Next up will be a nine-day Norwegian fjords cruise, leaving London on June 19 for stops in the Norwegian ports of Bergen, Olden, Molde, Trondheim, Alesund, and Stavanger (not to mention plenty of time to take in the stunning views offered by the Norwegian fjords). On June 28, 2020, the ship will sail from London to Barcelona (with stops in France, Spain, and Portugal). This will be followed by a series of nine-to-12-day Mediterranean sailings from Barcelona to Venice – with stops at some of the most popular ports in Europe: including Marseilles, France; Rome, Naples and Livorno (Florence/Pisa), Italy; Kotor, Montenegro; Corfu, Greece; Valetta, Malta, and Dubrovnik and Rijeka in Croatia. When it’s time for the Legend to come back to the states, she’ll do so in grand style with a 16-day trans-Atlantic sailing leaving Barcelona on October 30. Following stops in Spain, Portugal, the Canary Islands, Antigua, San Juan and Amber Cove, she’ll arrive in Tampa on November 15. This is something of a homecoming for the Legend, given that she was the very first Carnival ship to ever sail out of Europe (That trip was a three-night round-trip voyage out of Amsterdam). During her christening back in August of 2002, it took three tries for Godmother Dame Judi Densch to smash the traditional bottle of champagne against the hull… and when she finally was successful (with an assist from the ship’s captain), the famed actress wound up covered in bubbly. The ship itself is perfect for those looking for a smaller-to-midsize ship, weighing in at just over 88,000 gross tons with a capacity of around 2,100 passengers. Although refurbed back in 2014, the ship retained many of the features which made her unique. For example, while few modern ships have a theme which unites the various public spaces, the idea of honoring “legends” is still very much in effect here thanks to venues such as the Medusa’s Lair dance club and the Golden Fleece Steakhouse. (Of course, the Legend also features current Carnival faves such as the Alchemy Bar, the BlueIguana Cantina, the RedFrog Pub, and Guy’s Burger Joint.) And if you explore a bit, you might even find the “enchanted forest,” a perfect hideaway undiscovered by most passengers.